Magna Rose won the $75,000 Queen City Oaks on July 22 by nearly seven lengths for rider John McKee and heads up Saturday’s $75,000 First Lady Stakes at Mahoning Valley Race Course. A field of 3-year-old Ohio-registered fillies and mares will break from the Mahoning Valley starting gate on Saturday afternoon, Nov. 10, in the $75,000 First Lady Stakes. The seven distaffers will travel six furlongs over the Austintown dirt. Heading up the field is Magna Rose, a daughter of Magna Graduate out of the mare Woodflower, who is conditioned by Brendan Walsh for the Ten Broeck Farm, Inc. Rider John McKee has guided the filly to her most impressive efforts this season—victories in the $75,000 Queen City Oaks on July 22 when she won by nearly seven lengths; and in her last start on Sept. 13 in a Belterra allowance that she won by a mind-blowing 19 lengths. Bred by Ohioan Elisabeth Alexander and unraced as a 2-year-old, Magna Rose has amassed $81,880 thus far in her seven career starts, with four second-place finishes in addition to those two aforementioned triumphs. She sold for $70,000 at the 2016 Summer Fasig-Tipton Selected Horses of Racing Age Sale and is a half-sister to Where's Dominic (by Midnight Lute), a winner of 12 of 53 starts and $274,820. The multiple stakes winning Tango Run, a daughter of Run Away and Hide hails from the Doug Cowans stable, with earnings of $194,300 to date. Bred by Dr. Harold Fishman and owned by Michael Foster, Tango Run is out of the Tale of the Cat mare Thedoctorscat and is a half-brother to Dr. Advo Cat (by Closing Argument), a winner of $85,655 from two wins in 13 starts. Tango Run comes into the First Lady off a Thistledown allowance victory on Aug. 29, in a come-from-behind effort that saw her draw off by four lengths. She sold for $32,000 at the 2016 Kentucky Fall Fasig-Tipton Yearling Sale and earlier this season captured the $75,000 Southern Park Stakes at Mahoning Valley. Trainer Gary Johnson will tighten the girth on Loooch Racing Stable's Heavenhasmynikki in the First Lady. Bred by Langsem Farm, this daughter by Majestic Warrior is one of five foals out of the Forest Wildcare mare Floral Park, making Heavenhasmynikki a half-sister to the graded stakes placed, $213,959-winning Doug's Buddy (by Badge of Silver); the $206,732 earner and stakes winner Floral Sky (by Sky Mesa); $72,960 earning, allowance winner My Girl Cassie (by Northern Afleet); and allowance winner and $67,040 earner Fireupthejet (by CityZip). Heavenhasmynikki won the $75,000 Diana Stakes on Sept. 22 at Jack Thistledown and comes into the First Lady with $159,580 in her coffers from four wins and one third in nine career starts. Dancin' Rosie is a two-time winner in as many lifetime starts for trainer Jeff Radosevich and owner Michael Annechino. The daughter by Vaquero is out of the With Distinction mare Kiss Me Darlin and won her debut on March 19 at Mahoning Valley and scored her second victory on Oct. 14 in a Thistledown allowance test by an impressive 7½ lengths. Bred by Roger Braugh, Jr., Dancin' Rosie has $36,840 in her bankroll. Gary Patrick's Emmy's Candy rarely misses a check for her owner-trainer. This chestnut Sidney's Candy lass has a pair of allowance victories to her credit this season and lifetime has three wins, two seconds and three thirds from 11 starts, with $75,925 in her account. Dotthei has procured three allowance triumphs this season—two coming at Thistledown and one earlier in the season at Mahoning Valley. The Mike Rone-conditioned Haynesfield lass has career earnings of $92,507 from four wins and two seconds in ten lifetime starts. Owner-breeder Steven DeMaiolo also bred this filly's half-brother, the gelding Moves Like Ali (by Maclean's Music) a graded-stakes placed winner of $155,062 in his career from four wins in 12 starts. 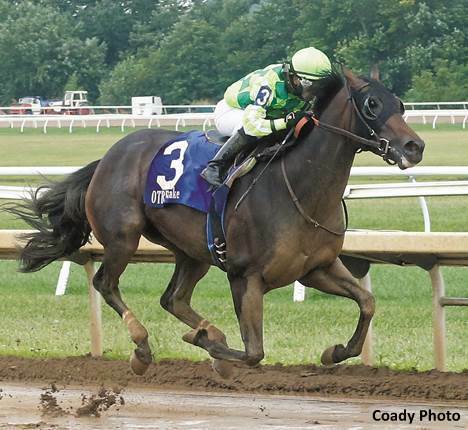 This entry was posted in Racing and tagged belterra, Brendan Walsh, First Lady Stakes, heavenhasmynikki, john mckee, magna graduate, magna rose, mahoning valley, ohio, ohio breeding, tango run, Ten Broeck Farm by Press Release. Bookmark the permalink.